What a journey it’s turning out to be - all starting from that little lino-cut mouse who was supposed to be a purse design. I now have a 21 page children’s picture book with 8 illustrations, an introduction, a front cover design and back of book blurb. I have a wonderful printing company ready to print them for me so I can sell them along with my little lino-cut mouse characters. That’s the plan anyway. Whether they will sell or not, whether or not, in future, it might even be published - wow, how amazing THAT would be! - whether anyone likes it or not, I’m so glad to have (nearly) done it. The story is from my heart and I love it, and that’s what matters. When a creative idea gets hold of you, I’ve found it’s no use struggling, you just have to give in and go with it! The illustration above is created using different techniques. 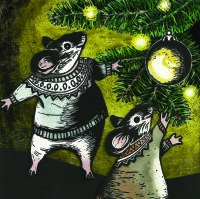 The lino-cut mice and the bauble decoration are printed on watercolour paper and coloured with acrylic inks as previously described. The tree branches, lovely golden background, and the twinkling fairy lights are all done on Scratchboard - a new discovery for me! Google it and have a look. The best ones are Ampersand or Essdee. You can achieve the most intricate detail. I used Ampersand Scratchbord Inks for the colours.